A clipping path, or clipping mask, is a path whose shape masks out everything except the image contents behind the shape. You can create one in Adobe Photoshop and then place it into your InDesign document with the Apply Photoshop Clipping Path option in the Import Options dialog box, or you can have InDesign try to create a clipping path from the edges of an image. Once you have a clipping path, you can select and modify it like any other path using the Direct Selection tool and change options using the Clipping Path dialog box. Click the Object menu, point to Clipping Path, and then click Options. Select the Preview check box to view your results in the document window. Click the Type list arrow, and then click Detect Edges. Specify a Threshold value to define the color used as the area outside the clipping path and Tolerance value to apply small color variations and smooth out the path. You can convert a clipping path into a frame. 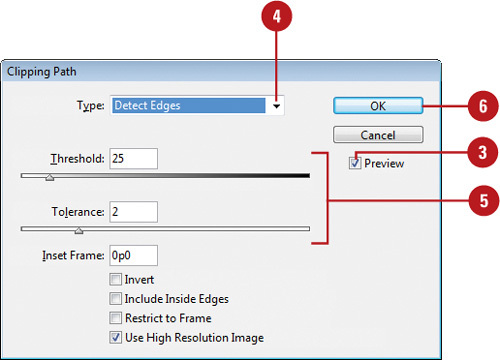 Select the clipping path, click the Object menu, point to Clipping Path, and then click Convert Clipping Path To Frame. Click the Type list arrow, and then click Photoshop Path or Alpha Channel. 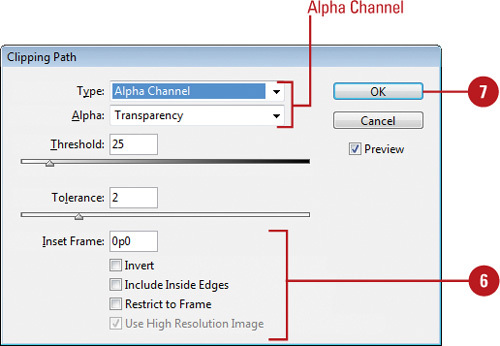 The list arrow below it changes to Path for Photoshop Path or Alpha for Alpha Channel. Specify a Threshold value to define the color used as the area outside the clipping path and a Tolerance value to apply small color variations and smooth out the path. Inset Frame. Use to enlarge (negative values) or shrink (positive values) the path in the image. Invert. Select to switch the visible and non-visible areas. Include Inside Edges. Select to add areas to the clipping path in the image. Restrict to Frame. 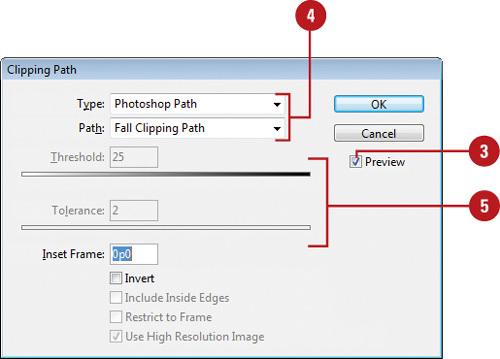 Select to prevent the clipping path frame from displaying areas outside the frame. Use High Resolution Image. Select to create the path from the high resolution version of the image.